How can FourCoach help you? Every coach we've ever met has passion for the game. They've got games they love to play with their students. 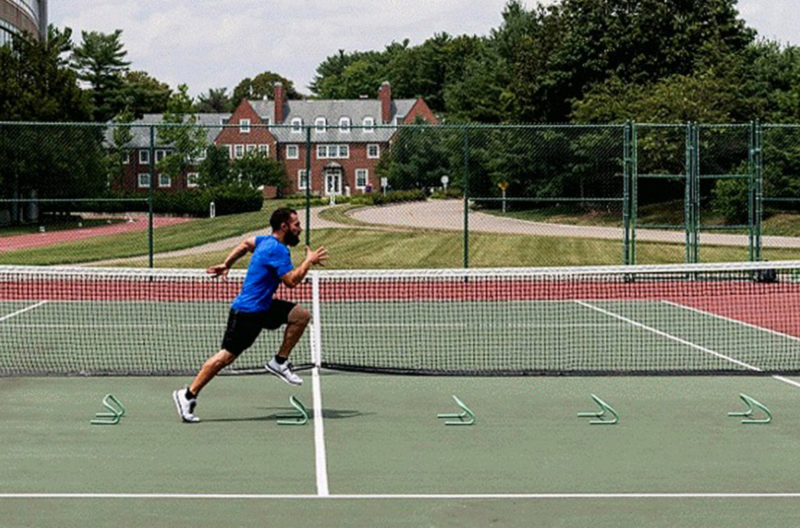 They've got drills that'll make players work hard and sweat. They've got knowledge for the game, both in technique and in the tactical sense. But every coach we've ever met is a coach because it's their business or their career. In any other industry, you need to demonstrate a level of accountability to your clients. 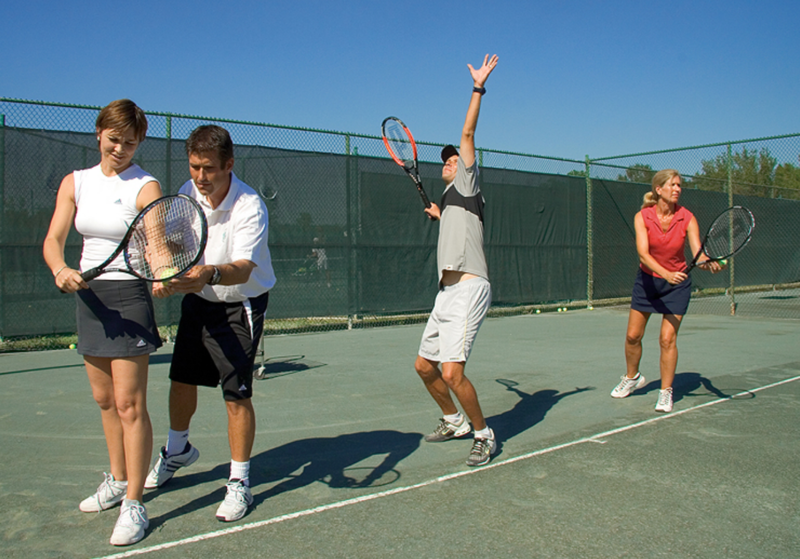 Your clients are the players and/or those who pay your fees. 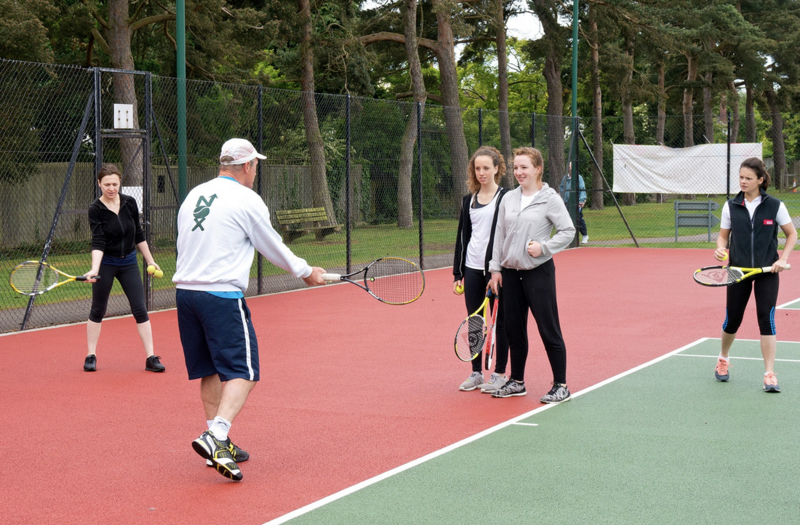 Tennis coaching is a form of education and therefore there needs to be progressions, modifications, lesson plans, assessments and reporting. If you sent your child to school and never received any feedback as to what they have and haven't learned to do, you'd seriously consider sending them to another school, especially if you're paying for them to be there. 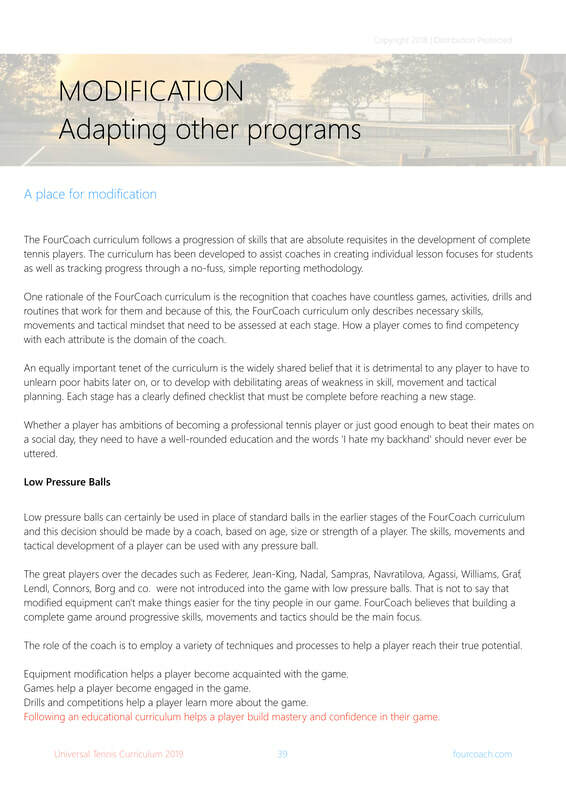 The FourCoach curriculum is straight-forward and developed by top players and coaches. It can be read and comprehended in under an hour. It isn't loaded full of game ideas or drills because coaches already have their own. One of the skills requiring competency to progress beyond Stage One is knowing how to 'hockey' the ball. In other words, 'golf-putting' the ball around the court. This teaches hand-eye coordination and touch without the challenge of the bouncing ball. Those with mastery will be able to hockey the ball along a court line. 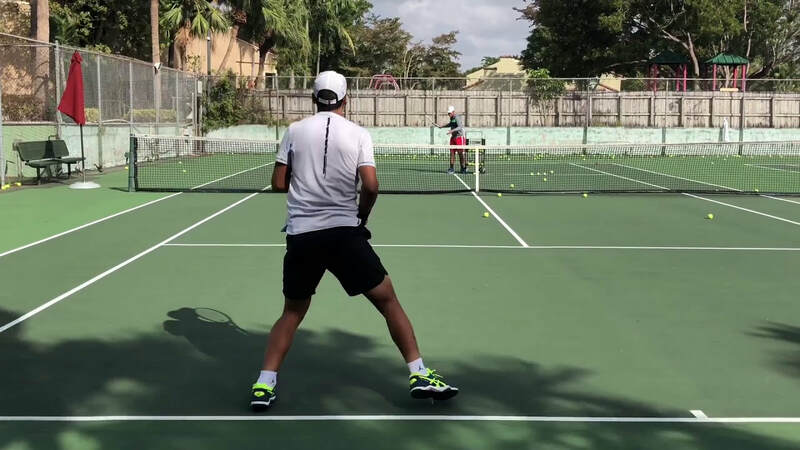 FourCoach believes that this is a skill that requires competency but it is the coach's role to determine how they will demonstrate, teach, facilitate through game or drill and finally how to assess the skill. 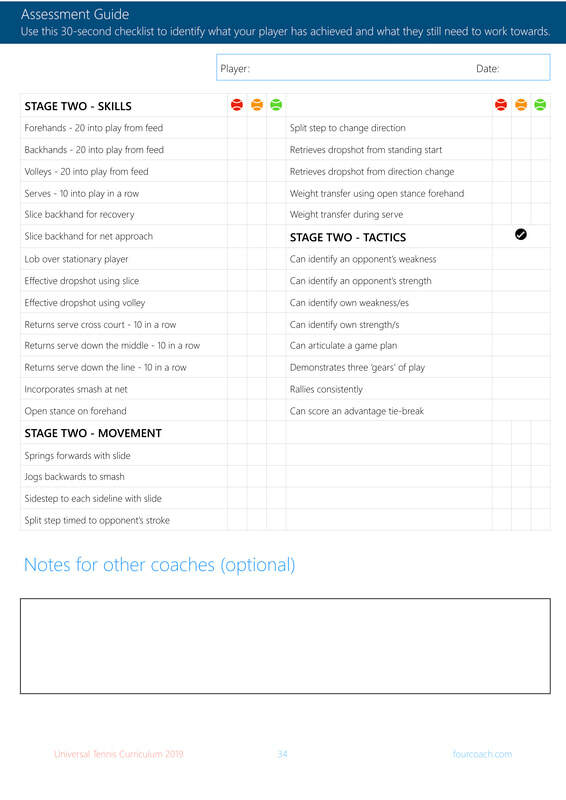 FourCoach has extremely quick and easy to use assessment entry for coaches to use on the go. These are in the form of checkboxes and are online and in paper form. 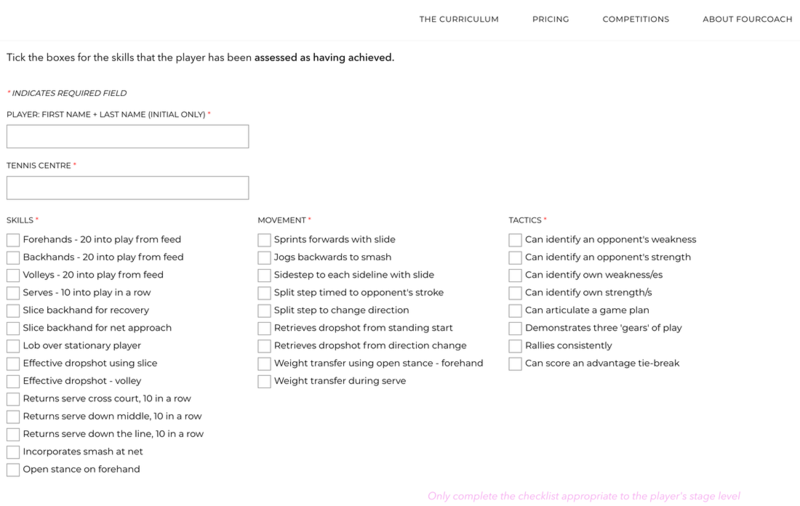 A full stage assessment for a player takes less than 30 seconds to complete. 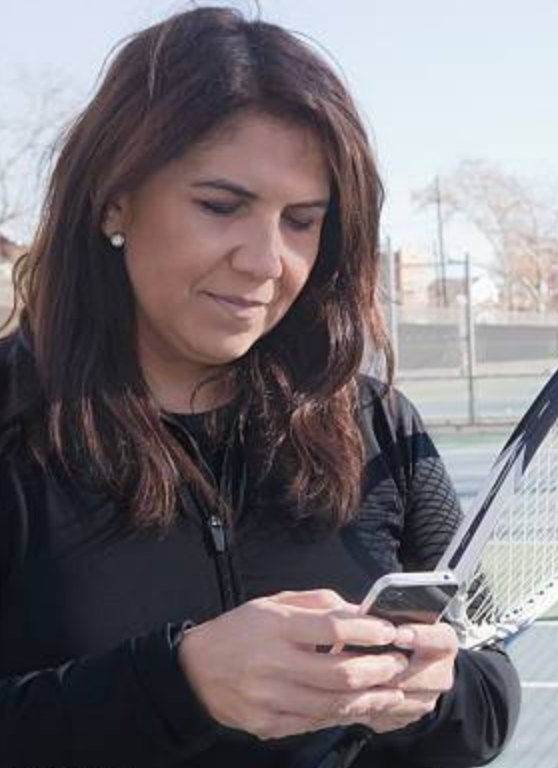 From that point, FourCoach can also generate non-branded reports for players, parents and for the coach's own personal records. 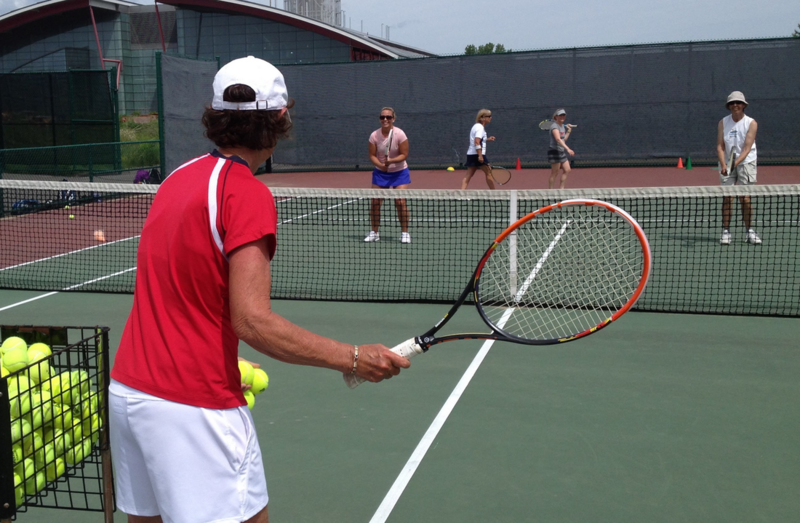 Players enter the game of tennis at widely differing stages of life. 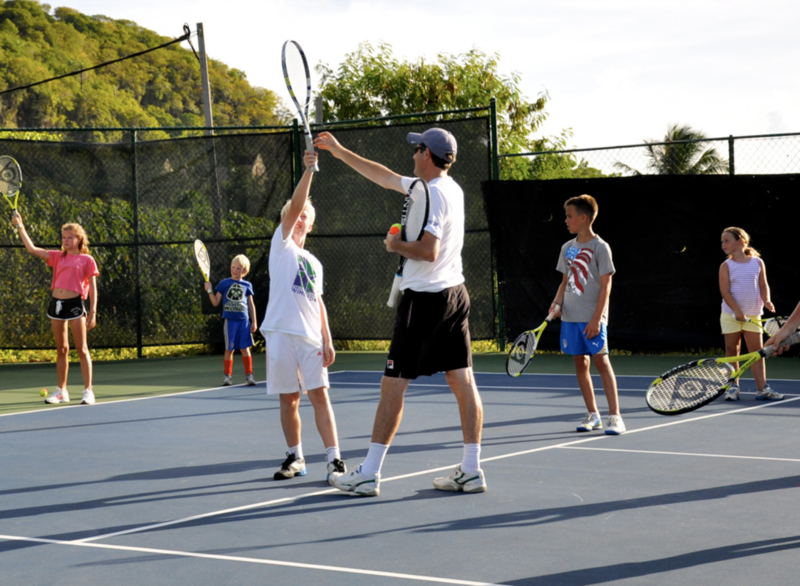 Some pick up a racquet when they're merely toddlers, while other take it up in their adulthood. But generally speaking and regardless of age, there are three types of student: those who take up the game for fun, fitness and social interactivity; those who take up the game wanting to master the game and take on the world; and those who want both. For the player who wants to play for fun, fitness and social interactivity, the reality is this: their ability to maximise enjoyment will be affected by their skill level - how long they can stay in the point, how accurate they are at engaging in a point where a number of different types of shots and shot placement are used. 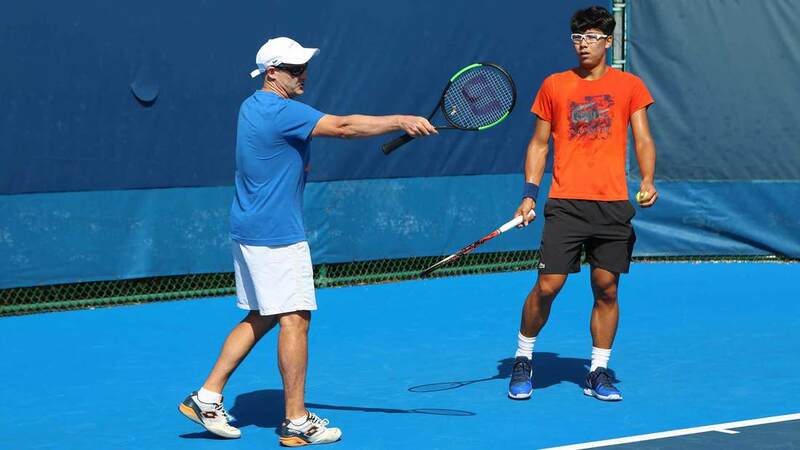 Their ability to work on fitness will be affected by their skill level (how long they can stay in a rally for) and their competency in tennis-specific movement. Finally, their ability to grow socially will be affected by the quickly noticeable disparity in player strength in competitions. A player who joins their first competition in C Grade may gradually see their team-mates and rivals move ahead to higher divisions and grades while they remain rudderless and stagnant. For the player who wants to achieve mastery and be highly competitive, there simply is no room for omissions in skill, movement or tactical understanding of the game. A small weakness not identified or amended will become a major weakness as a player grows and entire game plans will be focused on how to avoid a weakness instead of how to capitalise on strength. Existing tennis curricula and programs are few and far between, but there is a commonality among the more recognised resources: binders full of games, (some great, some not so great) and almost all focused on younger children playing with modified equipment on different sized courts. 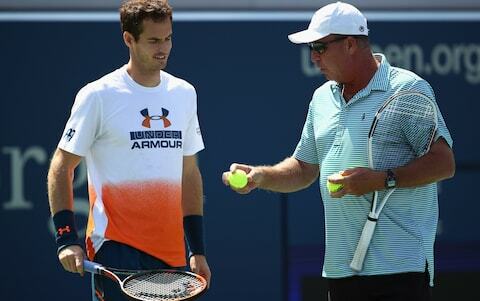 Little to no recognition is given to the players who are wanting to master every aspect of tennis. 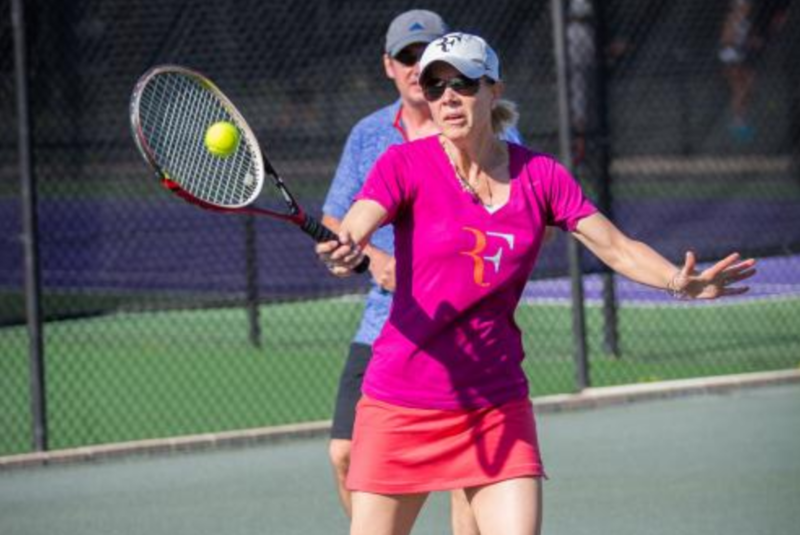 A bottom line is important, and state and national tennis bodies will need to meet targets and compete with other sports as far as engagement at school level goes, but tennis education is so much more than that. And it is because of this lack of a recognisable stage progression that is linear and measurable for every student at every level of the game that we see coaches simply going through the motions with little to no individual focus on what comes next in a player's development. Every coach wants their players to be great. Walk up to any coach on the court today and ask them what little Sally needs to work on and the answer will be 'her volleys' or 'her lob' etc. Coaches generally know what their students can and can't do but with tens to hundreds of enrolled students each week, how on earth does a coach have time to actually put thought into what they will cover in the next lesson? It's one thing to know that Sally needs to improve at lobs, but if there is no progressive curriculum to follow and no record of what she has already achieved, over time the easiest thing to do is just to avoid doing lobs in the lesson, or simply pay them lip-service. Sally won't like doing them because she never gets them right, and the coach won't like doing them because you can't just 'teach a lob' in a few minutes. 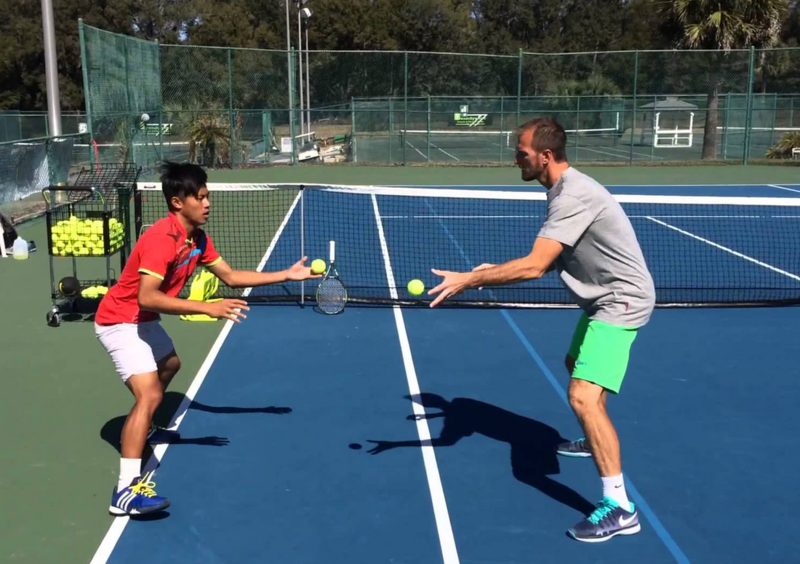 A lob, like many facets in tennis, is not a shot in isolation: it is the combination of correct footwork, movement to the ball, grip and placement. If Sally hasn't demonstrated the ability to put topspin on the ball, she will struggle to hit an offensive lob. If Sally hasn't been assessed at hitting the correct arc on a ball to get it to go high over a net player and then land deep, she will struggle to hit any lob. If Sally hasn't shown that she can slide out wide to play a defensive slice forehand, how will she manage to comprehend using a defensive lob in a competitive match? 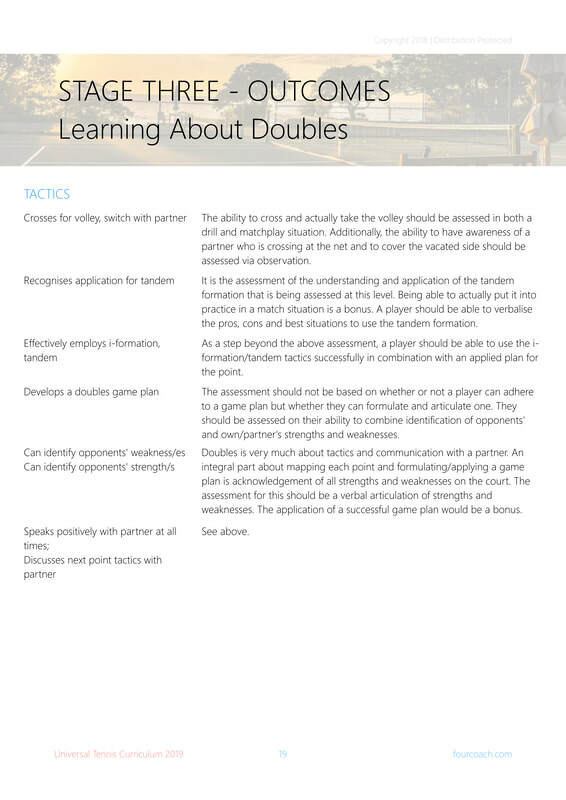 As mentioned earlier, coaches generally know what needs to be done but they don't have time to write a lesson plan or individual learning plan for each student that will be at the courts that day. A straight-forward curriculum with assessments that can be completed in under 30 seconds naturally becomes a roadmap to success. At a quick glance, a coach should be able to see what a player already knows how to do and what the next skills are to be taught in a linear progression. 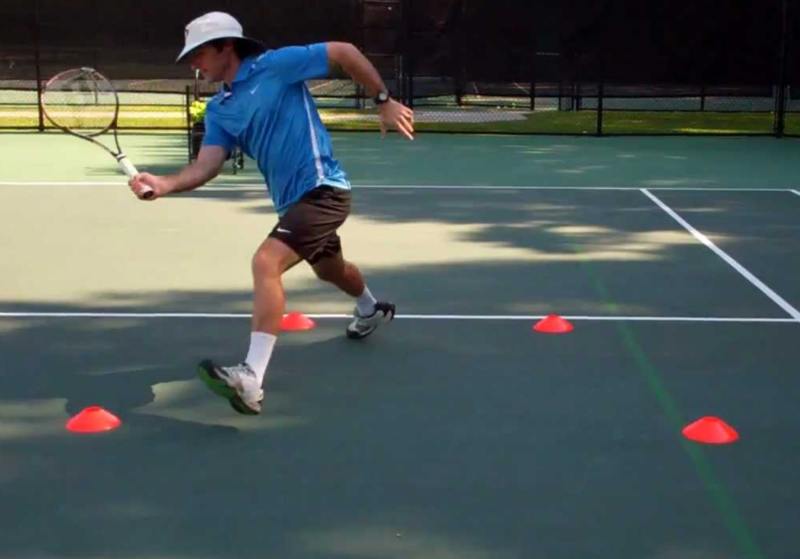 A coach who sees that the next skill to be introduced, demonstrated, practiced and applied for assessment is the slide out wide to slice forehand will have games and/or drills in mind where players are running, sidestepping and sliding. That same coach will choose the best way to assess that a player can slide out wide, whether it be through observation over time or a set test, eg: 'Start centre-baseline and sprint to the sideline. Start your slide on your outside foot inside the sideline. Slide your foot so that it leaves a slide mark that pushes over the sideline into the tram-lines. Sidestep back to centre-baseline and do it again. Complete this task 10 times correctly and you'll have demonstrated competency'.